The MPS should demonstrate through their community engagement work, how they will raise understanding of, and public confidence in, the use of DNA in policing. Where the police take an individual in need of immediate care or control to a police custody suite as a place of safety as set out under section 136 of the Mental Health Act 1983 (as opposed to the individual being arrested for a recordable offence), the MPS should ensure that their DNA will not be taken. The MPS should undertake a full Equality Impact Assessment (EIA) on the use of DNA within the MPS to address the impact of the use of DNA and the DNA Database on communities within London. This should seek to identify any disproportionality and include details of specific actions the MPS will take to address issues identified. It should be reviewed on a regular basis. 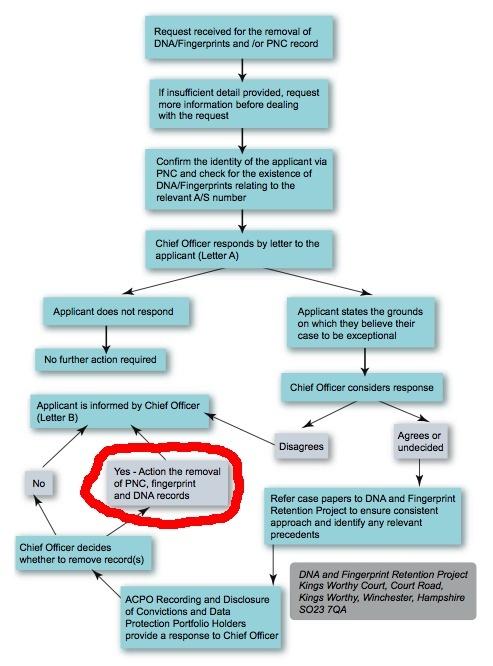 Agree a clear process outlining how and when DNA samples are to be taken, processed and retained within custody. Train all officers and staff responsible for taking a DNA sample to ensure the procedure is undertaken correctly. Develop an agreed chart detailing each step of the process which should be prominently displayed in every MPS custody suite (accessible to both MPS personnel and arrestees). This chart should be dated and subject to regular review. For all suspects arrested following a match on the DNA database between their DNA profile and an unsolved crime stain, it is MPS practice to take a confirmatory DNA sample from the suspect on their arrest. This is resource intensive and not standard practice across all forces. Therefore the MPS should provide a rationale for this including the costs for undertaking this practice. The MPS should put in place procedures to ensure the removal of personal and demographic details prior to sending DNA samples to the forensic service providers. In relation to volunteer samples taken for elimination purposes, the MPS should ensure forensic service providers are informed when the criminal justice process has been concluded to ensure the DNA sample and corresponding DNA profile are no longer required and can be destroyed. The MPS should specify how MPS budgets will be impacted by the provisions within the Protection of Freedoms Bill. This should detail immediate and ongoing cost obligations. The Panel ask that the MPS begin the implementation of our recommendations immediately. We have made it clear that our recommendations are both necessary to increase public confidence and complementary to the provisions in the Protection of Freedoms Bill. The Panel therefore request that the MPS respond to our recommendations within three months of the publishing of this report with a timetable for implementation. These will then be reviewed by the Civil Liberties Panel.